DOWN District Council celebrated World Autism Awareness Month tonight (Monday 8 April) by participating in Autism NI’s ‘Light It Up Blue’ campaign. 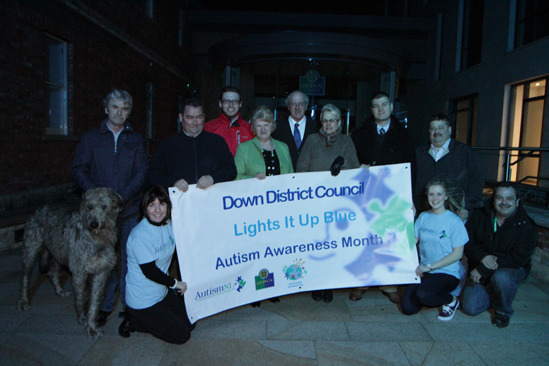 The Down Civic Forum is lit up blue in support of Autism NI – Included are, from left, Down District Councillors Eamonn Mac Con Midhe, Terry Andrews, Gareth Sharvin, with Strangford MP Jim Shannon and South Down MP Margaret Ritchie, and Councillors Colin McGrath, Billy Walker and Liam Johnston. Pictured front row are Audrey Mullan and Rachel Gribben of Autism NI. The Downshire Civic Centre which was ‘lit up’ in blue lights joins iconic landmarks throughout the UK and the rest of the world, including Trafalgar Square, Sydney Opera House, the Empire State Building, the Pyramids and the Tokyo Tower in Japan to raise awareness for Autism. Autism is a lifelong developmental disability that affects how a person communicates with, and relates to, other people. It also affects how they make sense of the world around them. It is a spectrum condition, which means that while all people with Autism share certain difficulties, their condition will affect them in different ways. There are currently over 20,000 people diagnosed with Autism within Northern Ireland, which outstrips the total number of those affected by Down’s Syndrome, Multiple Sclerosis and Parkinson’s Disease. World Autism Awareness Day therefore shines a bright light on Autism as a growing global health concern. Each year Autism NI raises awareness for the disability through a coordinated Awareness campaign during the month of April, including the Stormont 5k Walk on Saturday 27 April. Down District Councillors and South Down MP Margaret Ritchie attended the lighting up of the Civic Centre to show their support for the charity. Autism NI is Northern Ireland’s Autism charity and works to provide life changing services for the 20,000 people affected by Autism throughout Northern Ireland. Formed in 1990 by a group of concerned parents and professionals, the charity seeks to ensure that people with Autism Spectrum Disorder and their carers have access to appropriate services, enabling people with Autism to become valued members of the community. The charity supports a network of 23 branches and local support groups across Northern Ireland and provides support, information and training for individuals with Autism and their families. For further news and information please visit www.autismni.org.